Heading into Battle on the Bank this year, there was little doubt that the L.A. Derby Dolls and their Ri-Ettes all-star team were the runaway favorites to repeat as banked track champs. Having destroyed both their closest rivals earlier in the year, the San Diego Derby Dolls Wildfires and the Arizona Derby Dames Hot Shots, Los Angeles did not have have much in the way of resistance to claim the title for the second straight year. Despite the winner being a foregone conclusion, there was still a lot to look forward to a few steps lower on the bracket. At the bottom, the Sugartown Rollergirls and Penn-Jersey Roller Derby got their first taste of the RDCL national tournament. In the middle, Tilted Thunder and the OC Rollergirls showed that they are not too far off from competing for the podium, putting in a good showing against the top teams after putting on a great show against each other. And off to the side, the juniors of the RDCL demonstrated that it won’t be long until they replace the players occupying their eventual spots on the senior rosters. But back to the top steps. Though San Diego was seeded ahead of Arizona, it wasn’t an easy pick to say who would overcome the other on the way to the finals. But it was all but certain that which ever one did would lose to L.A. in the finals, making the battle between them a race for second place. The double-elimination format of the tournament virtually ensured both teams would face each other twice: Once in a 30-minute game in the winners’ bracket on Saturday, and again in a full tilt the next day for a place in the grand final. Thank goodness they did. The two AZ/SD games, by a fair margin, featured the most engaging, most fascinating, most exciting roller derby I have seen at Battle on the Bank out of the four editions I have attended. Dare I say, it was the most compelling action I have seen in the Doll Factory in two or three years—a period which includes all-star appearances by Gotham, Rocky Mountain, Team Legit, and Team Bionic, among many other top-tier teams that have rolled through in that time. A bold statement, that, but there are numbers to back it up. In ninety total minutes of gameplay between the two teams, leads larger than 20 points were a short-lived luxury. Sustaining a low double-digit lead was about as good as either team could manage throughout. In the 60-minute semifinal game, teams were averaging less than 2 points each per jam. Two! Factor out power jams, and it was even closer. Close scores are one thing, but with the 2013 RDCL rules having almost eliminated “cheap” points gifted to teams during goating and power jam situations, it was literally back to the case of every point mattering and every point needing to be fought for tooth-and-nail. The sausage non-engagement tactic has, for all intents and purposes, been eliminated in the new rules. Front-loaded defenses were at a formidable advantage, forcing both teams to engage and assist offensively to break through. Packs were moving at a reasonable speed, allowing a defense trapped ahead of a goat time to lock on to, match speed with, and slow down an opposing jammer wanting to complete a pass, making goating itself less effective and no longer an easy play to complete a full pass. This restored competitive balance to gameplay, but it also created a most exciting side-effect. If two equal teams both have an equal chance to play defense, are equally proficient at playing offense in the pack, and have jammers of equal speed and skill levels, odds are that both jammers are going to frequently complete their initial pass equally—or simultaneously, as it were. That is exactly what happened in the Arizona/San Diego games. I don’t have an exact number, but I can almost guarantee that their games saw the highest number of close double-jammer breakouts all weekend, by a fair margin. In fact, a good percentage of jams had jammers within a quarter-track of each other or closer after completing the initial pass, leading to a hard and fast jammer race back to the rear of the pack. This often led to low-score, and even no-score jams, but not for a lack of action. The RDCL: Where 0-0 jams are amazing! As both teams began to realize that uncontested scoring passes were rare, the only thing they could do was gain every millisecond of advantage they possibly could with the jammer race on the track and against each other in the pack to secure a favorable position for the scoring pass. The AZ/SD games at Battle on the Bank were brilliant examples this kind of hold-your-breath gameplay. However, they also showed clear signs that the strategy behind jammer-race contested scoring passes is yet-to-be discovered by many teams in roller derby, not just those in the RDCL. There was one jam in particular that demonstrated this. In the last jam of their Saturday 30-minute semi-final game, Arizona found themselves down to San Diego by the score of 76-71. With 0:37 showing on the period clock, there appeared to be only enough time to for one final 60-second jam. However, RDCL rules dictate that a quarter can only end when the period clock expires during an in-progress jam. This means if a jam is called off with any time on the period clock, even if it is one second, another full jam must be played to complete the game. In this case, if the jam takes 36 seconds or less, there would be one more jam; if the jam is 37 seconds or longer, it would be the last jam and the game would be over. With that in mind, Arizona sent The Lap Dancer to the jammer line, with San Diego fielding Kung Pow Tina. Down by five points, but up 3-2 in the pack, the Hot Shots positioned their blockers on the start line in a way that suggested they were going with defense, defense, defense, hoping their jammer could get out alone against a thin San Diego blocker contingent and score a grand slam (or more) to avoid the loss. When the jam got underway, Arizona sent a blocker forward ahead of the pack, only to quickly drop back and use their blocker advantage to wall up in the rear and focus on preventing San Diego’s jammer from spoiling their comeback bid. What unfolded next was quite possibly the most interesting jam I had ever seen live in the modern derby era. Here is that jam. Focus on the period clock in the upper corner, as it quickly became Arizona’s enemy…and perhaps without them realizing it, their potential saving grace. With an Arizona blocker getting tripped up at the start, that effectively left two 2-walls going into turn 2—Arizona in the back, San Diego in the front—to play defense and contain the jammers from getting out. With that much room to maneuver, it was pretty easy for jammers like Tina and Dancer to make their way through the pack as it inevitably spread out. Unfortunately for the Hot Shots, Kung Pow Tina got out first for lead jammer. 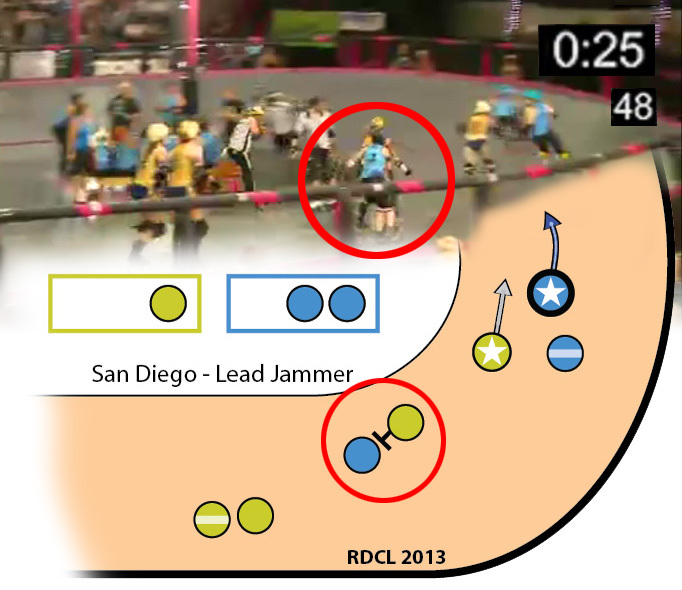 The Lap Dancer was right on her tail for Arizona, but since the lead jammer is always the jammer physically in the lead in RDCL play, San Diego had control of the jam and could end it at any time she was leading the jammer race. Click here to see the full AZ/SD game. It was good! Despite their advantage at this point, slim as it was, San Diego was caught in a tactical no-man’s land. With both jammers clear, 0:25 left in the game, and 48 seconds left in the jam, San Diego had to balance draining the clock to try and win the game and risking losing lead status and potentially losing the game, or at least giving Arizona another jam to work with. On the one hand, Kung Pow could try to slow up Lap Dancer. but overdoing it could result in a pass and loss of ability to call off the jam. KPT could try entering the pack with Dancer right behind her, but getting blocked out of bounds would also prevent her from ending the jam (the lead jammer must be in-bounds to call off the jam in the RDCL) allowing Arizona a chance to score and enough time to play another jam. Or worse, Arizona might have even been able to get an extra pass in and win the game right then and there. While San Diego had to figure out what to do on the fly, for Arizona the goal was less complicated. Once Tina escaped the pack and picked up the initial lead, it was—or at least, should have been—immediately clear to the Hot Shots that without lead status, their best and most realistic hope was to try and end the jam with any time left on the period clock, whether they gained or lost points, in the hopes of putting themselves in a much more favorable position in the next-and-final jam. But the current situation wasn’t good for them. Kung Pow Tina was just burning clock so she could end the game without further hassle and The Lap Dancer was not fast enough to win back lead status on her own. Down by 5 points but with only 4 points immediately available in the pack, the result appeared inevitable. This is where things started to get really interesting. Without lead status, Arizona could not directly end the jam to extend the game. However, they were capable of ending the jam indirectly by forcing the San Diego jammer to do it for them. Let me explain. Remember San Diego’s tactical options? They could be classified into two different categories: The Easy Way (let time expire, call off jam, win game) and The Hard Way (anything that gives Arizona a chance to extend or win the game). The Easy Way takes Arizona’s involvement from proceedings out of the equation completely. The Hard Way means Arizona will be able to get scoring passes and/or another jam to come back and try to take the win. San Diego wanted to do things The Easy Way, of course. What Arizona needed to do was make San Diego to do things The Hard Way, the only way that would give them a chance to make a play and stay in the game. But with the jammer race not likely to force San Diego’s hand, the only other players available on the track to make them do it were the Arizona blockers. If the Hot Shots could gain control of the pack and slow it down, the San Diego jammer would approach the pack with time left on the clock and have no choice but to do things The Hard Way, giving Arizona a chance, however small, at winning the game. Since there is no better way to slow down the pack than to capture a goat and hit the brakes, the best possible strategy the Arizona blocking corps needed to use was to do just that. And this is where things started getting absolutely fascinating. Goating—the act of trapping a single opposing blocker behind a wall—is normally something a team does when their jammer is the only one out to score, allowing him or her to rack up the laps around a slow pack. But when both jammers are out on the jam with little between them, the strategy behind wanting to slow down the pack completely changes. In this case, Arizona slowing the pack would have shortened the track distance Kung Pow Tina had to cover to reach the back of the pack, reducing the amount of time needed to catch up to it. San Diego wanted to burn clock without entering the pack, however, and the only way to do that within a shorter distance would be to compensate with a slower approach. In that case, KPT would have to forcefully slow down Lap Dancer to prevent them from having to enter the pack too early…but that would give Arizona a chance to swipe lead jammer status. If matters couldn’t be settled with jammer-on-jammer action, the scoring players would enter an Arizona-advantaged pack with likely enough time remaining for another jam after the fact. But the risk in doing this, to the potential benefit of Arizona, is that it would allow Lap Dancer a much greater chance of picking up points off the lone goated blocker—3 points, in fact, when you factor in SD’s blocker penalty ghost points. Once both jammers cleared the pack, Arizona’s success or failure in the jam rested on the success or failure of a single block, as circled here. The blocker, Scarlett Knockout, had to contain and slow the last San Diego blocker behind her. Doing so would give the trailing Arizona blockers the opportunity to form a wall in front of the blocker, letting them slow the pack down enough to give them the chance they needed to extend the game. Failing to do so would allow the two San Diego blockers to slink the pack away, increasing its speed and giving the San Diego jammer the extra time and distance needed to drain the clock out in the open. Unfortunately for the Hot Shots, Scarlett was not able to slow down the opposing half of the pack on her own. Once San Diego moved to the front, they were able to keep the pack moving fast—a rate of about 14 seconds a lap. This allowed their jammer to skate at a ridiculously fast 9½-second-per-lap rate for an astonishing 2½ laps, fast enough to comfortably keep the Arizona jammer in her wake and a distance long enough for the game clock to almost completely expire by the time the jammers got into scoring position. Once they did, the writing was on the wall for Arizona. With one second left in the game, Lap Dancer had to take a desperate lunge past Kung Pow Tina to try and make something happen. Something happened, alright: A back block penalty, which sent The Lap Dancer to the box and sealed the 80-71 victory for San Diego. Although Arizona lost this game, they would get their revenge in the loser’s bracket final by beating San Diego 128-112. A Pyrrhic victory, it turned out, as 13 out of 14 Arizona players were completely out of gas by the second half of the final against Los Angeles, a game they lost 262-63. The only Hot Shot with any jump in her step in the end was Goody Goody Blooddrop, playing in her final event before retiring from roller derby. She played like it and won tournament jammer MVP honors, leaving everything on—and off—the track. Goody Goody Blooddrop fell out of the track. She got back in and finished her scoring pass, 4pts. 51-50 AZ. Wow! However, despite coming second place, Arizona was not the second-best team at Battle on the Bank this year. “The Most Interesting Jam in the World,” as described above, showed exactly why. In both of their contests against San Diego, Arizona had a very difficult time scoring in situations where they were first out of the pack with lead jammer, but with a small lead on the track over the trailing San Diego jammer. On the flip side, San Diego seemed to have more success in tight jammer races, scraping off minor points in places Arizona was unable to in similar situations. Particularly in the 60-minute loser’s final, San Diego was very consistent, always maximizing their scoring when they had good opportunities to score and pushing out a good deal of points in less-favorable positions. Arizona had a lot of lead jammer situations slip away from them due to their blocking corps letting San Diego scoot to the front of the pack, forcing a defensive call-off as the San Diego jammers sometimes found themselves in better scoring position, despite not being the jammer in the lead. The ‘Zonians also made some curious pack decisions, often dropping to the rear after the San Diego jammer cleared the pack, leaving their own jammer to get roughed up and slowed down—preventing her from getting through quickly in response. The “let’s drop to the back of the pack” strategy in particular was the one that put them out of position in the last jam of the winner’s semifinal game, as explained above, and doomed their hopes of a comeback victory there. Halftime in the Loser-Places-Third game. San Diego 60, Arizona 44. AZ hanging on w/timely PJs, but aren't playing pack position/speed well. Arizona’s pack work, and often their lack of it, demonstrated that even if a team has a lot of skating experience or blocking prowess, if they are behind the times strategically, it’s going to come back to bite them eventually. The same could be said about any form of roller derby, naturally. But the new RDCL rules environment has created a new kind of game—which is starting to resemble the old game—where almost all of the slow-game tactics simply do not work anymore. Not only do defenses need to worry about blocking jammers, but they now must also factor in how and when to block opposing blockers. This change, which is not insignificant, creates three new considerations for packs to think about during regular jams. The first is during the initial pass. With the (re)adoption of the fair and equal roller derby jam start, there is no way to form a solid 4-wall, or even a 3-wall, without the opposing team having something to say about it. With an absolute defense less likely, teams will now need to decide on whether or not to press the issue and force-form a wall, or spread out and commit to offensive blocking within different levels of the pack. The second is the period between the completion of the initial pass and the start of the scoring pass. In the old RDCL rules (and current WFTDA rules) there tended to be a brief “reset” period in the pack where blockers often regather themselves, assess their situation, and then wall up and prepare for the scoring pass. But with close jammer races becoming more common, this lull can be detrimental to a team should they allow opposing blockers gain position, thereby giving them more options to score, defend, or change the speed of the pack whether they have lead status or not. The third is during the scoring pass itself. In a tight jammer race, if you’re a lone blocker at the rear of the pack, you’re either an easy point (or points, if ghost points are available) or the reason your jammer isn’t able to score more points, being forced to call off the jam before the other team scores on you. Since it’s a lot easier keep blockers behind you than it is to get in front one, if a scoring-pass blocking strategy requires blockers to be biased toward the front of the pack, it’s a hell of a lot easier to have started off there in the first place. If you watch the last jam video again, you’ll see where Arizona faulted on all three of these points. On the initial pass, they let the San Diego blockers take the front of the pack (point 1) without bother entering turn 2. As both jammers broke clear, the two rear Arizona blockers dropped back and watched things happen in front of them (point 2), rather than staying active and trying to help their teammate contain. And during the scoring pass, the Arizona 3-wall at the rear completely ignored the two San Diego blockers as they continued to slink the pack forward; if it weren’t the last jam, San Diego could have easily dropped back to disrupt the wall (point 3), punching a hole for their jammer and potentially picking up 4 points with a quick call-off. All of these things happened because Arizona’s blockers were over-focused on the San Diego jammer, sacrificing pack position for defense too early in the jam, only to find out later that it was too difficult to recover from that position in the fast pack that they allowed the other team to create. Arizona is a good team, and these are things they should start correcting once they review the archived Battle on the Bank VI footage of their performance. 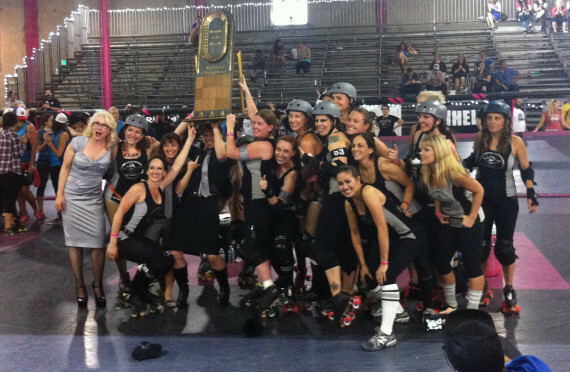 However, they should really take a look at the team that beat everyone on the weekend, the L.A. Derby Dolls. They are masters of blocker positioning and blocker-on-blocker engagement during all jam phases. They know not to over-do it on the initial pass or put themselves out of position on the scoring pass. They know how to make something happen in the pack during the transition period when they have to, instead of just waiting for something to happen. And they’ve won the last two Battle on the Banks. How interesting.